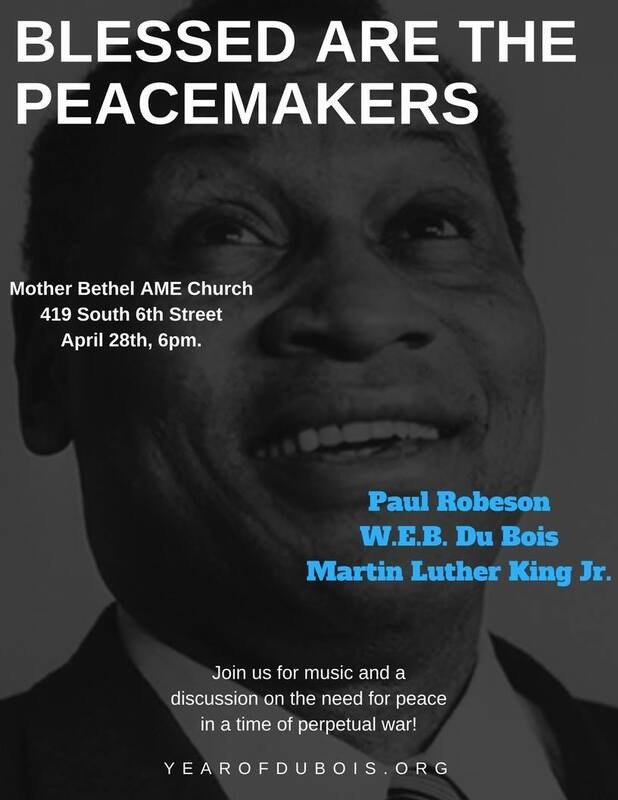 Commemorating the lives of Paul Robeson, W.E.B. Du Bois and Martin Luther King Jr.
​Tens of millions of people around the world are acutely aware of the danger of war including world war and nuclear war. Peace is a decisive issue for our time. 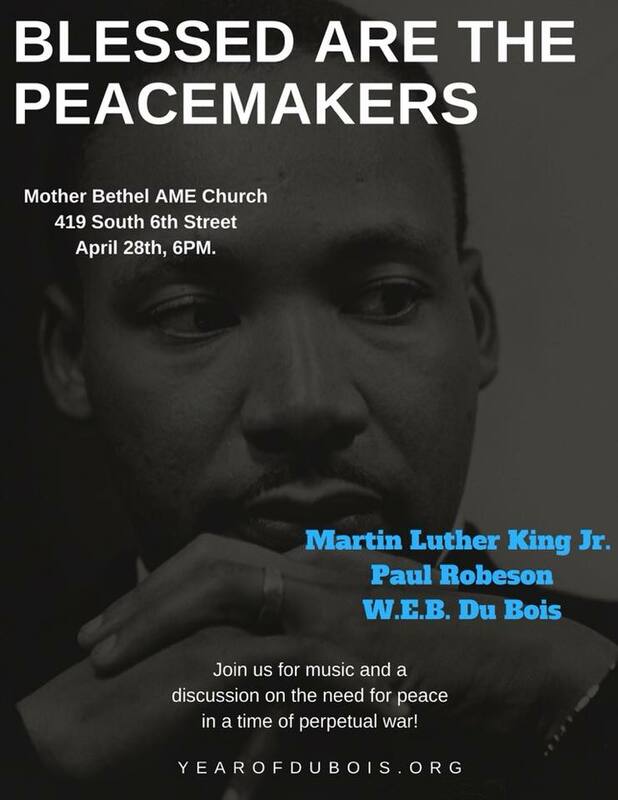 On April 28th, 2018 a gathering of Philadelphians concerned with peace will take place at Mother Bethel AME Church from 6:00-9:00 PM. The program entitled “BLESSED ARE THE PEACEMAKERS” will bring together Christian, Muslim, Jewish, Hindu, and Buddhist peace traditions. The legacies of Paul Robeson, W.E.B. Du Bois and Martin Luther King Jr. will be commemorated as fighters for world peace and against nuclear war. Their example compels us to continue struggling for positive peace which includes racial and economic justice. The speeches, music and words of Paul Robeson, Martin Luther King Jr. and W.E.B. Du Bois will be played as we explore a way forward to build a peace movement in this time of perpetual war. ​On February 23rd-24th, 2018, The Saturday Free School will hold a kickoff celebration for the 2018 year of Du Bois, Pan Africa Pan Asia: A World United for Humanity at the Church of the Advocate. The event will consist of a symposium discussion of three books by W.E.B. Du Bois: Black Reconstruction, The World and Africa, and The Dark Princess, followed by a cultural celebration. The cultural celebration will include music, dance, and poetry from Africa, India, Latin America, and jazz from Afro America. Performers include the Eritrean Youth Dance team, Bharatanatyam dancer Ramya Shankaran, the Universal African Dance Ensemble, Ursula Rucker, Zumbi Soweto, Bobby Zankel, and Alfie Pollitt. The 2018 Year of Du Bois is a year long series of symposiums and celebrations of the life and works of scholar, scientist, and fighter for world peace, William Edward Burghardt Du Bois. 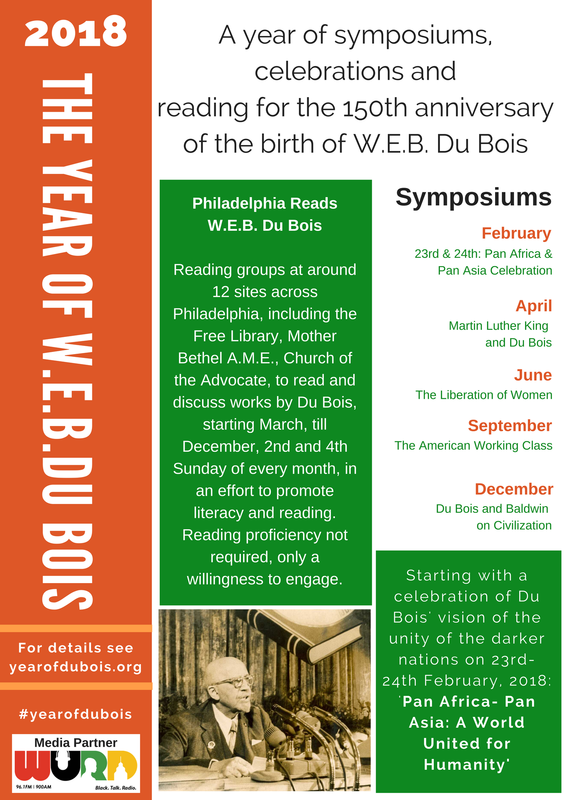 A part of the year is Philadelphia Reads Du Bois, a literacy campaign in which people will read Du Bois every second and fourth Sunday of the month throughout 2018 in over fifteen locations including the Central Branch of the Free Library of Philadelphia, Union Hall 1199C, The Church of the Advocate, Mother Bethel AME Church, the Christian Association, Princeton Theological Seminary, Temple University, Jubilee Elementary School, and Kensington High School for Creative and Performing Arts. On Thursday, February 1st, the Philadelphia City Council unanimously passed a resolution declaring 2018 as the Year of W.E.B. Du Bois. The bill was sponsored by Councilwoman Helen Gym, but also championed by Councilwoman Jannie Blackwell, whose late husband, Lucien Blackwell, was a public servant and student of W.E.B. Du Bois. Our website www.yearofdubois.org includes the vision, schedule, images, video, and other resources. Attached are the flyers for the 2018 Year of Du Bois and the kickoff celebration Pan Africa and Pan Asia: A World United for Humanity. Please send any questions or inquiries to the yearofdubois@gmail.com.